(AP) NASHVILLE, Tenn. - Stephon Tull was looking through dusty old boxes in his father's attic in Chattanooga a few months ago when he stumbled onto something startling: an audio reel labeled, "Dr. King interview, Dec. 21, 1960." He wasn't sure what he had until he borrowed a friend's reel-to-reel player and listened to the recording of his father interviewing Martin Luther King Jr. for a book project that never came to fruition. In clear audio, King discusses the importance of the civil rights movement, his definition of nonviolence and how a recent trip of his to Africa informed his views. Tull said the recording had been in the attic for years, and he wasn't sure who other than his father may have heard it. "No words can describe. I couldn't believe it," he told The Associated Press this week in a phone interview from his home in Chattanooga. "I found ... a lost part of history." Many recordings of King are known to exist among hundreds of thousands of documents related to his life that have been catalogued and archived. But one historian said the newly discovered interview is unusual because there's little audio of King discussing his activities in Africa, while two of King's contemporaries said it's exciting to hear a little-known recording of their friend for the first time. Tull said his father, an insurance salesman, had planned to write a book about the racism he encountered growing up in Chattanooga and later as an adult. He said his dad interviewed King when he visited the city, but never completed the book and just stored the recording with some other interviews he had done. Tull's father is now in his early 80s and under hospice care. "I would ... say that it is a method which seeks to secure a moral end through moral means," he said. "And it grows out of the whole concept of love, because if one is truly nonviolent that person has a loving spirit, he refuses to inflict injury upon the opponent because he loves the opponent." The interview was made four years before the Civil Rights Act became law, three years before King's famous "I Have a Dream" speech, and eight years before his assassination. At one point in the interview, King predicts the impact of the civil rights movement. "I am convinced that when the history books are written in future years, historians will have to record this movement as one of the greatest epics of our heritage," he said. King had visited Africa about a month before the interview, and he discusses with Tull's father how leaders there viewed the racial unrest in the United States. "I had the opportunity to talk with most of the major leaders of the new independent countries of Africa, and also leaders in countries that are moving toward independence," he said. "And I think all of them agree that in the United States we must solve this problem of racial injustice if we expect to maintain our leadership in the world." Raymond Winbush, director of the Institute for Urban Research at Maryland's Morgan State University, said the tape is significant because there are very few recordings of King detailing his activity in Africa. "It's clear that in this tape when he's talking ... about Africa, he saw this as a global human rights movement that would inspire other organizations, other nations, other groups around the world," said Winbush, who is also a psychologist and historian. "That to me is what's remarkable about the tape." U.S. Rep. John Lewis, a Freedom Rider who organized Tennessee's first lunch counter sit-in at age 19 in Nashville, said hearing King talk about the sit-ins took him back to the period when more than 100 restaurant counters were desegregated over several months. "To ... hear his voice and listen to his words was so moving, so powerful," said Lewis, adding that King's principles of nonviolence are still relevant today. "I wish people all over America, all over the world, can hear this message over and over again," he said. The Rev. Joseph Lowery, who worked with King while a leader of the Student Nonviolent Coordinating Committee, agreed. "I can't think of anything better to try," Lowery said of nonviolence. "What we're doing now is not working. An eye for an eye, a tooth for a tooth. Matching violence with violence. We've got more guns than we've ever had, and more ammunition to go with it. And yet, the situation worsens." A spokeswoman for King's daughter Bernice, head of The King Center in Atlanta, said she was traveling and couldn't comment on the audio. Tull is working with a New York-based collector and expert on historical artifacts to arrange a sale. The broker, Keya Morgan, said he believes that unpublished reel-to-reel audio of King is extremely rare and said he's confident of the authenticity of the recording based on extensive interviews with Tull, his examination of the tape and his knowledge of King. He's collected many of the civil rights icon's letters and photos. "I was like, wow! To hear him that crisp and clear," Morgan said. 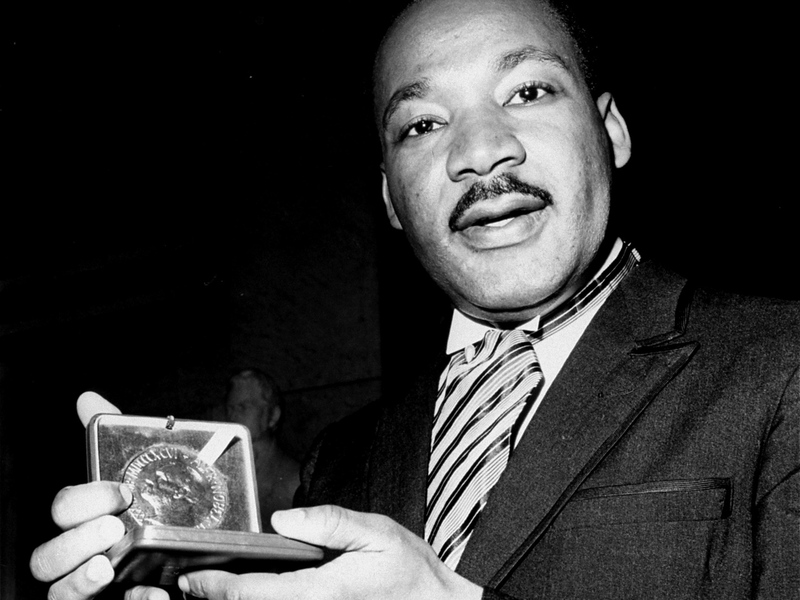 "But beyond that, for him to speak of nonviolence, which is what he represented."